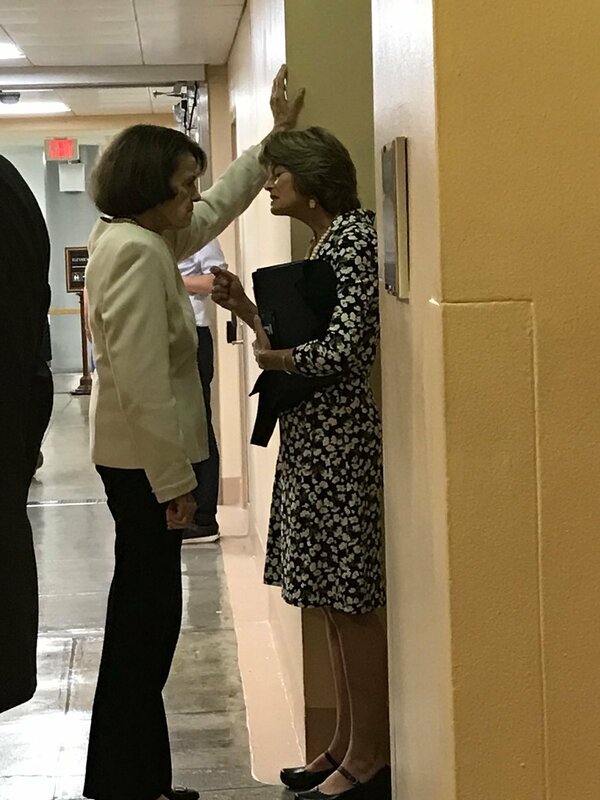 Looks like Facepalm Feinstein is making Senator Murkowski and offer she can’t refuse, doesn’t it? Note the glower, the just a little bit too close body placement and Murkowski with her back to the wall. DiFi’s arm high on the wall, almost as if threatening a blow, and surely keeping Murkouski from escaping in that direction. What is heartening to me is that Murkoswski doesn’t seem to be all that cowed by Dirty Di’s aggressive posturing. To me it looks like an intimidation play that isn’t going Facepalm’s way. There’s no two ways about it, Feinstein, you went for the lowest, dirtiest play you could think of and not only did it not work, it was so childishly, so clumsily done that everybody saw through it, and what’s worse, you got called on it on national TV. Say, doesn’t that animated oven mitt look a lot like Crooked Hillary Clinton? And isn’t that funny looking woman behind her the spitting image of Clueless Chrissy Ford’s lawyer? Huh! I wonder what those two might have to say to one another? What strange confluence of circumstance brought this gruesome twosome together at this time? Life is sure funny sometimes, ain’t it?